Dungeons & Dragons has its certainties. Jeff Rients' description for newbies covers the basics: "You play Conan, I play Gandalf. We team up to fight Dracula." But if you've played before, you can be sure of much more than that. You know that Dracula's castle was built long, long ago. The villagers that he victimizes won't have jobs constructing his new lair next door, or minting fresh coins for his treasure vaults, because D&D thrives in the shadow of ages gone by. Chances are that Dracula's scheming to wake horrors from the distant past, and you'll defeat him using an ancient artifact or nearly-forgotten lore. Play long enough to build a stronghold and you'll reach the climactic Battle of Evermore that turns it into the haunted ruins of the next campaign. The Dungeons & Dragons universe is forever rising from the ashes of one apocalypse and rushing headlong toward the next. It's been that way ever since the first adventurers set foot in Dave Arneson's Blackmoor back in 1970-71. In the Temple of the Frog adventure that introduced the gaming public to the original D&D campaign world, Room 5 contains a pipe organ, "the only musical instrument of its kind still in existence." Knowing that the fact that it weighs ten tons won't stop players from wanting to loot it, Arneson tells us that "Any person so attempting to take apart or put this instrument back together will either have to find the only priest who knows how to, or decipher the cryptic manual on artifacts found amongst the volumes in the Library." 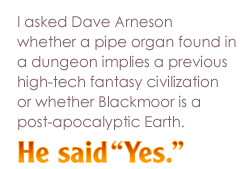 At a Gen Con seminar a year before his death, I asked Arneson whether this pipe organ implies a previous high-tech fantasy civilization or whether Blackmoor is a post-apocalyptic Earth. He said "Yes," and when the laughter died down he explained, "My players haven't figured that out yet." Cities fell, rivers left their banks, volcanic ash destroyed the settlers' fields, and the system of food production and communication was gone. Mankind began to slip downwards into barbarism. Old machines took on a divine aura, and as they failed, men lost the knowledge to repair them and were forced to adapt to non-technological life in a difficult environment ... Darkness, not only of the skies but also of the mind, closed down over Tekumel forever. Civilization persists only within widely separated 'points of light' in a world of mysterious, untamed darkness. The darkness shrouds a ruin-littered landscape, a world built on the foundations of lost empires of unimaginable antiquity ... These ruins tell a tale of heights achieved, then long falls. If you've got darkness encroaching, ruins, and fallen empires, then you've got the Dungeons & Dragons apocalypse, whether it's 2008 or 1975.